This week, I’ve been up to some really random things in the garden. Okay, not random – but I have been really trying to focus on harvesting things as much as possible. Let’s take a quick look at some of the things I made! First, I wanted to make some floral ice. I’ve seen this done on the internet about ten million times, and I wanted to see if it was worth the hype. Of course, I have to say it – make sure that you’re only using edible flowers that are SAFE! Lots of flowers out there are very toxic, so ALWAYS do your research to ensure that you’re only using ones that are edible and have no side effects. Additionally, ensure that they have been grown without pesticides or that they have not been exposed to other nasty chemicals. Overall, the flower ice cubes turned out to be really pretty. However, I really hated the way the petals started floating in my drink once the ice started to melt. I think if I were to do this again, I would just use the flower ice in a cooler to keep my bottled drinks cold – and then use normal, regular ice in my drinks. Oh well. I also picked the last of the salad greens this week. I may have already mentioned, but the hot weather has really made things speed up. The spinach has all bolted, the lettuce is starting to bolt, and even the peas are starting to dry up. Looks like we’ll have to wait until fall for more salad greens. Last, but certainly not least, are the mulberries! If you’ve been following along on the blog for awhile, you might remember that a wild mulberry tree sprung up in my yard years ago. The neighbor across the alley from me has one, and I can only assume that the birds planted this one. You may also remember that my other neighbor has been trying to kill the tree by dumping gasoline on it from under the fence – but whatever. Anyway, I’m fairly certain that no gasoline has been dumped this year – and the crop is absolutely beautiful. I’ll go ahead and give another safety message since I didn’t plant this tree. Never eat anything that you find or forage unless a trained person has identified it. When foraging or picking wild fruits – your safety is so important. There are a lot of really nasty plants out there that you definitely do NOT want to eat. 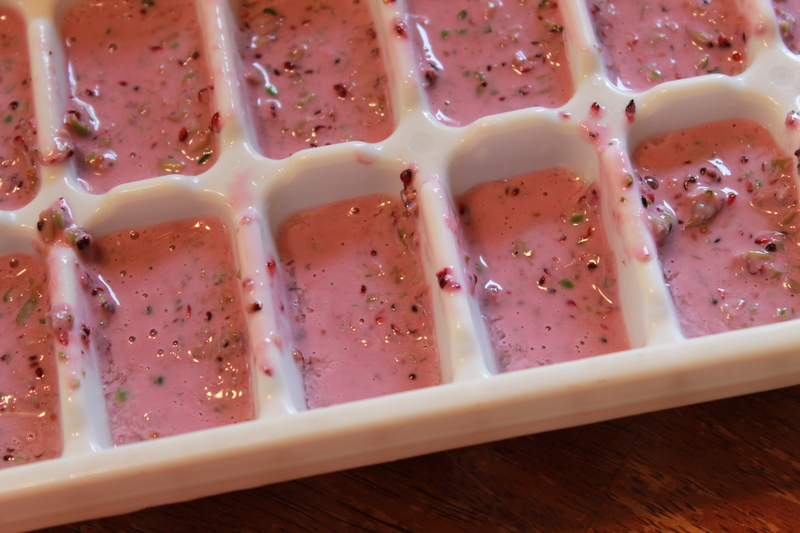 This week I made some really tasty frozen yogurt bites using greek yogurt, mulberries, frozen garden peas, and mint. I basically just mixed them together in a blender. I didn’t measure anything, because well – honestly, I’m not a good cook. If you ever plan on trying something like this recipe, you may want to consider running the yogurt through some cheesecloth before freezing it. I usually don’t mind things like seeds in my berries, but I could definitely see where some people might be a little annoyed by it. That’s it. What’s going on in your garden this week? I would love to hear all about it in the comments below! I hope you’re having a great day!